In one of the year’s more groan-worthy feats of movie marketing magic, Disney recently slapped their plucky horse ’n’ housewife drama “Secretariat” with a paradox of a tagline in “The Impossible True Story.” No sooner had they done so than assorted sniggering blogger types responded with a perfectly reasonable question: if the story is impossible, how can it be true? That said, whoever ends up handling Peter Weir’s currently distributor-less “The Way Back” may rather wish they had bagged this ropey tagline first. Adapted from the ghostwritten 1956 memoir by Slavomir Rawicz, a former Polish cavalry officer and Gulag labor camp survivor, the film tackles a story that is indeed “impossible” in the Disney-dictionary sense – read: extraordinary – but also, to some extent, in the literal one: two years after his 2004 death, Rawicz’s account was entirely discredited by historians. In the book, following the 1939 invasion of Poland, a 25 year-old Rawicz is arrested, tortured and unjustly convicted of treason by the Soviets. Sentenced to 25 years’ hard labor in the remote Gulags of Siberia, he is placed in a POW chain-gang and subjected to a gruelling two-month journey northwards, whereupon the scarcely less arduous drill of prison life begins. So far, so true. 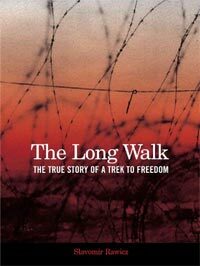 The trouble lies in the remaining two-thirds “The Long Walk,” in which Rawicz details his remarkable escape from the camp with six fellow prisoners, culminating in the epic trek to freedom of the book’s title: a year-long, 4,000-mile journey on foot from Siberia to India, crossing the Gobi Desert in between. For 48 years following the book’s publication, Rawicz’s was regarded as one of the great survival stories, until 2006, when a BBC investigation uncovered the considerably less dramatic truth: that he had actually been released from the camp in 1942, following the general amnesty granted Poles in the USSR. Generations of readers may have felt cheated, then, but only last year, a further twist was added to the tale when it was discovered that Rawicz’s memoir might not be entirely fictitious after all: the events described may not have happened to him, but they did, allegedly, to Witold Glinski, another Polish WWII survivor who claims Rawicz appropriated his story. Into this rather messy situation now comes Hollywood, and as is so often the case, they are siding with no one but themselves. In his first film since 2003’s Academy-endorsed but otherwise under-appreciated “Master and Commander: The Far Side of the World” (and, interestingly, his first solo screenplay since 1990’s decidedly different “Green Card”), dilatory auteur Weir has solved the did-he-didn’t-he problem by formally fictionalizing the entire work. Renamed characters and a new, if equally generic, title (which should also sidestep any confusion with narratives involving Nelson Mandela – or Whoopi Goldberg, for that matter) effectively distance the project from its now-controversial source material, but the available synopses suggest Weir otherwise hasn’t deviated too far from the text. A good story is a good story is a good story, after all, and Rawicz’s, true or not, is a doozy; frankly, considering the book’s relative popularity, it’s surprising that it’s taken five decades to reach the screen. In a sense, “The Way Back” therefore faces a similar commercial obstacle to Weir’s underperforming previous feature, which bravely downplayed splashy gung-ho dramatics in favour of finely drawn internal conflicts and a moving fraternal love story. Should Weir take a similarly, and appropriately, character-oriented approach to this particular male bonding story, the result might once more please awards voters – though in the seven years since the director last went to bat, old-fashioned period epics have proved a tougher sell to that crowd too. Happily, Weir is working with many of the same collaborators – notably Oscar-winning DP Russell Boyd and editor Lee Smith – who made “Master and Commander” such a rich and robust work; Boyd, in particular, should have ample scope to impress with a story that spans such disparate, spectacular landscapes as the snow-whipped Russian steppes and the locust-plagued Mongolian desert. Should the film find favor, however, the person best poised to benefit is 32 year-old British star Jim Sturgess, taking on the central role of Rawicz himself (renamed Janusz for the film). A hardy, taciturn figure granted more in the way of noble endurance rather than grand dramatic gestures, the character presents an actor with emotive and physical challenges that recall those faced by Adrien Brody in “The Pianist” or (this comparison again) Viggo Mortensen in “The Road”; this represents a sizable opportunity for the hitherto untaxed Sturgess to make a lasting impression. The supporting cast is multinational, as are the characters – a concern I have for the film is that a selection of Irish, British, American and Eastern European actors using English to convey multi-accented Russian and Polish could lead to Europudding chaos. That aside, using the book as my guide, it’s the already-feted Saoirse Ronan who would appear to have the most to work with: the character of Kristina (christened Irena for the film), an orphaned 17 year-old escapee from a separate camp who falls in with the men, has the shortest arc of the principals, but the most broadly sympathetic one, with the most wrenching outcome. It’s more difficult to tell, however, who might come out ahead amid Sturgess’s male cohorts, who include Colin Farrell and Ed Harris, given that Rawicz affords them such indistinct personalities in the book. Indeed, he often drops their names in favor of such idle tags as “the American” or “the Lithuanian” – just one of perhaps several clues in the writing that Rawicz’s story wasn’t coming straight from an entirely personal place. If Rawicz shares many a Hollywood screenwriter’s resolve not to let the truth get in the way of a good story, we can only hope that affinity bodes well for the screen version. Does Harris’ character have a direct equivalent in the book? I’m just curious if, if so, it’s an awards-y character, since I’ve heard speculation this could be his Bridges/Pacino Oscar if the movie turns out well. Yes, it does — as an American (but Russian-speaking) POW. As I said, the secondary male roles are all fairly underwritten, though his probably has the most potential. I’m glad you think Ronan’s part is meaty. I hope this film makes better use of her than The Lovely Bones did. Ronan’s the only reason I care about this film. Come on, 2nd actor ever to get another nom after a 16-and-under nom. Never Let Me Go is boring. If this film turns out to be a hit with the critics & ends up getting other oscar buzz, Saoirse Ronan could see herself getting nomiated for Best Supporting Actress. Due to her snub for The Lovely Bones they might feel sympathy for snubbing her and nominate her for this, does anybody remember Judi Dench who lost for Mrs. Brow, and won the next year for Shakespeare In Love, though I’m not saying Saoirse will win, but she’s probably get a make-up nomitation for snubbing her in The Lovely Bones. That’s what you care about? How about, you know, the actual performance? Jason: How was Ronan “snubbed” for The Lovely Bones? Adequate performance in an embarrassing failure of a movie — she was lucky to get those BAFTA and BFCA noms. The Academy dodged a bullet there — I can’t imagine there’s any collective guilt over that omission. I’m not too concerned about the accents. Ronan and Farrell have already shown they can mask their accents pretty well. (As a side note, I did not know Colin was Irish until IN BRUGES). Plus, this is Peter Weir we’re talking about, one of the most perfectionist directors around. Aside from INCEPTION, this is my top film to see for 2010. I read the book when it first came out. I was the first book that I had read to the end. A captivating story that included a sighting of a yeti. There are no car chases, gun fights or love making so the film may not make a lot of money. I believed it until now. no, the shortest arc was traversed by the poor guy with the night blindness who freezes to death within metres of the campfire. his end was also the most wrenching imho. re: accents, if you’re going to collaborate all over the place, why not get actors who can speak the tongues in question and subtitle? it’s a travesty when they speak in heavy ‘accents’ from which the audience is to infer speech in another language. Substitute Rawicz with Glinski and you have a true story. Amateur historian Linda Willis is the one who found the identity of Mr. Smith, (Harris’ character) and established that an unknown individual told Slavomir Rawicz of Witold Glinski’s escape experience. Willis also established that real names of the other escapees are different than the names in Rawicz’s ghostwritten book.